Post news Report RSS	DESPOILER Gameplay Trailer - Free Beta out Now! We're really excited to share our Gameplay trailer, edited by our artist Harrison Armitage-Bath, with a lovely sound mix by the talented and professional Jesse Sidders! You can download and play the alpha for free right now straight from indieDB! edit: Since removed - see most recent update for how you can help test! If you'd like to see DESPOILER developed further, please consider dropping us a vote on greenlight! And now, some information about the game and how it plays - see what you think! In Despoiler, teams scavenge valuable scrap from the level, and the team with the most at the end of a (15min) match wins. Scrap can be found laying about the environment - left by the miners who've long vacated the lands. Their old silos are also still full of the stuff, so tear them apart with your weaponry and make it rain. 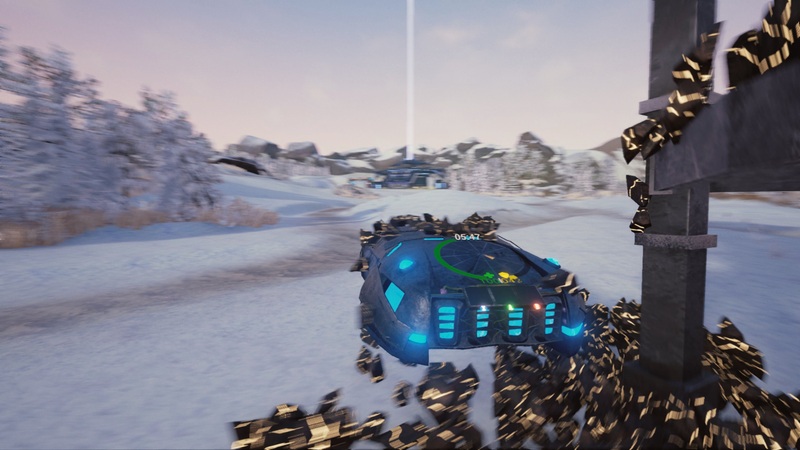 Scrap is carried on the hull of your hovercraft where it absorbs damage, functioning like armour. Scrap is also heavy and the more you have the heavier and slower your vehicle will get. Drop scrap off at your teams base, to unlock Utilities and Vehicles, which can be equipped in the upgrade garage. Careful, though, re-spawning costs your team some scrap, and if left unchecked you can find yourselves set-back significantly. If you do fall behind, you can always make a run on the enemy scrap reserves, clawing your way back into the lead. Hope you enjoy the beta! If you find any bugs (spoilers: you probably will) you can report them at our website. We'll also be sharing our plans for the future on our DevBlog if you'd like to have a look there from time to time. You can also like us on Facebook or Follow us on Twitter and Instagram to keep up-to-date and see some sweet behind the scenes goodies if you're lucky. Not usually a fan of racing games but I think I will REALLY love this game. The concept was VERY fun actually. More like a battle race tournament. Sadly there were zero players when I tried the alpha demo.